Lens-style camera is the ultra-portable camera which ever have which can be attached to a connected smartphone with a supplied mechanically adjustable adapter. 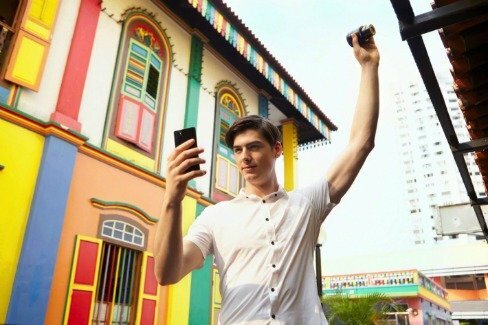 It also can be used for independent device even mounted to a tripod while still maintaining all functionality and connectivity with the smartphone. The pretty cool ideas are these two DSCQX100 & DSC-QX10 lens-cameras have a shutter release, memory card slot and come with a rechargeable battery. The lenses come complete with their own Exmor sensors, BIONZ image processor, Zeiss optics and wireless connectivity to your Android or iOS device with the PlayMemories Mobile application used as the camera management app. First of all, you will need to download Sony’s PlayMemories software into your devices. This apps is available for both Android and iOS devices and is used to control the QX10 & QX100. Lens camera need to be pair with smartphone using a password which can get it on the manual or inside the battery compartment lid on each of the lens. To get started, you just turn on the camera then connect to the device’s ad-hoc access point with Sony’s Play Memories app and the app does the rest. QX100 features a premium and high quality 20.2MP Exmor RCMOS sensor. 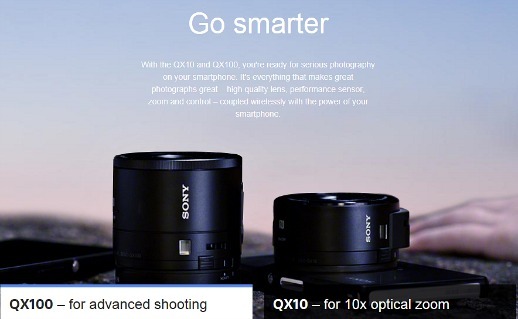 Expertise or more advanced photographers will be more focus on the “quality” QX100 which have 1-inch 20.2MP sensor and 3.6xf/1.8-4.9 lens. With these advantages, it allows for exceptionally detailed, ultra-low noise images in any light conditions, including dimly lit indoor and night scenes. The sensor is paired with a fast and wide-aperture Carl Zeiss T lens and a powerful BIONZ image processor to ensure the quality of images and HD videos. There have several different shooting modes offer to users which can automatically recognizes 33 different shooting conditions and adjust the setting to suit it. For example, it has Program Auto mode, Aperture Priority, Intelligent Auto mode and Superior Auto mode. It expected to cost $500 with a larger image sensor. QX10 it’s specifically geared toward entry-level shooters with mid-range optics and limited manual control. It is for the zooming enthusiasts; as it uses 10x optical zoom Sony G Lens pouring light onto an 18.2MP Exmor R sensor. It’s also extremely portable and lightweight with less than 4 oz weight and measuring about 2.5’’X 2.5’’X1.3’’. It is a suitable tool for travel photography. It expected to cost $250 with 10x optical zoom.